Spelling. Are you looking for Eophysema, Neophysema, or Zaphysema? What does emphysema mean as a name of something? 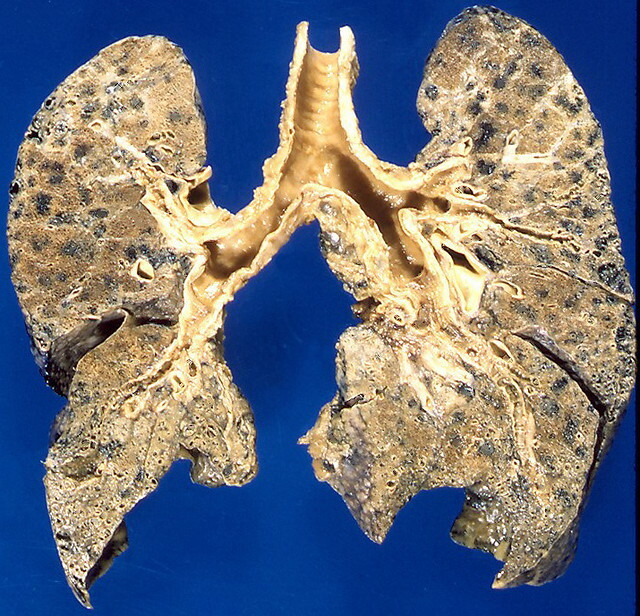 [pathology] An abnormal accumulation of air in tissues , especially the lungs. 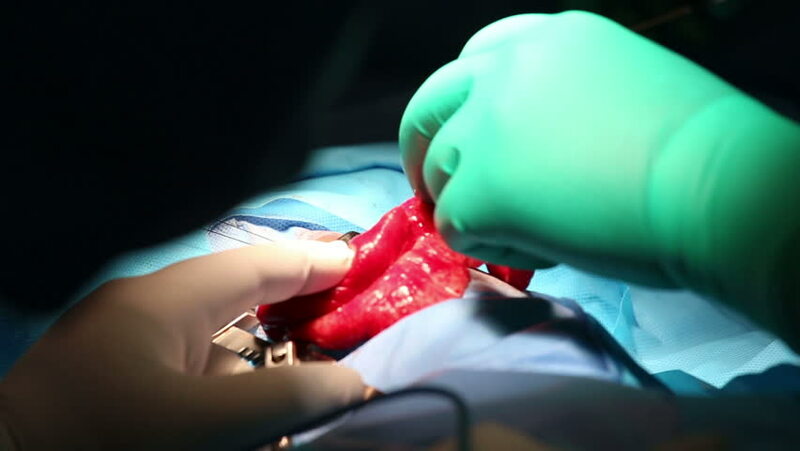 Pulmonary emphysema is a chronic lung disease, characterised by an abnormal increase in the size of the air spaces, resulting in laboured breathing and caused by exposure to toxic chemicals such as tobacco smoke. A common sign of emphysema is that the patient must work to exhale and make room for inhaled air . 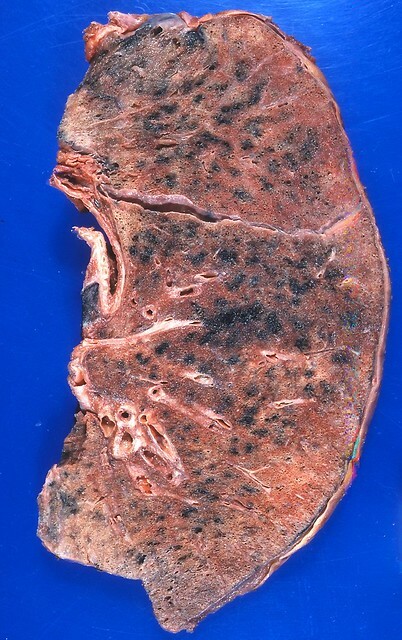 Typical centrilobular pattern of lung destruction accompanied by deposition of anthracotic pigment. 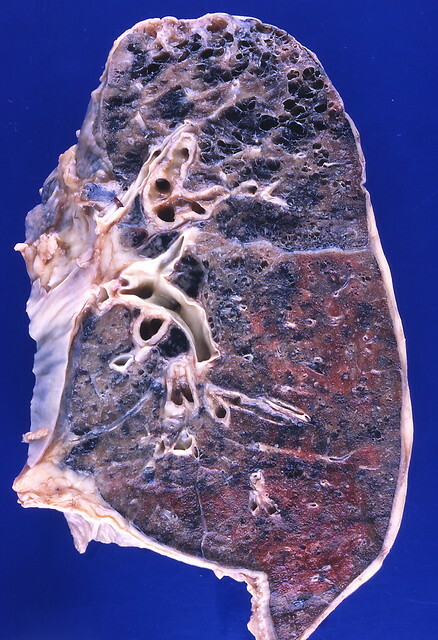 Typical pattern of centriobular emphysema predominantly involving the upper lobe. The upper lobe lesions are extensive and are replacing entire lobules; the centrilobular pattern is not obvious in this region. It is more obvious in the middle and lower lobes. 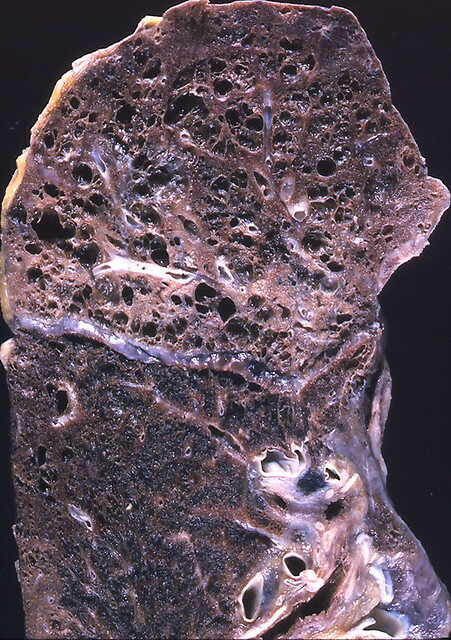 Emphysema with bullous areas. A bulla is defined as an emphysematous space greater than 1 cm. A bulla is defined as an emphysematous space larger than 1 cm. 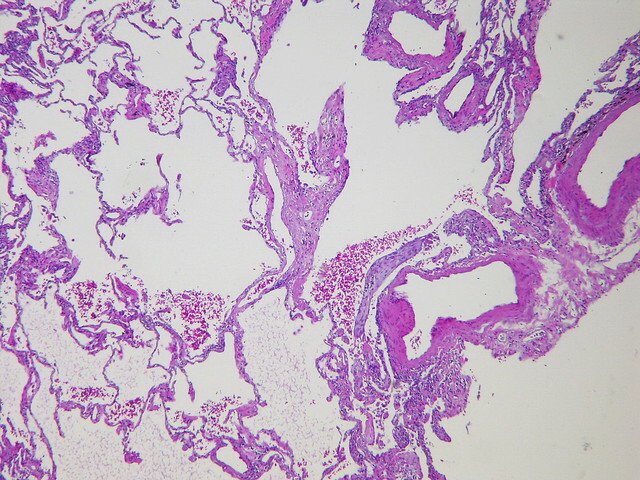 There is diffuse destruction of lung tissue throughout the secondary lobules without any evidence of localization around centrally located bronchovascular bundles as seen in centrilobular emphysema. Smoking appears to potentiate the development of panlobular emphysema in individuals with alpha-1 antitrypsin deficiency. There is destruction and disappearance of alveolar walls leaving emphysematous spaces. 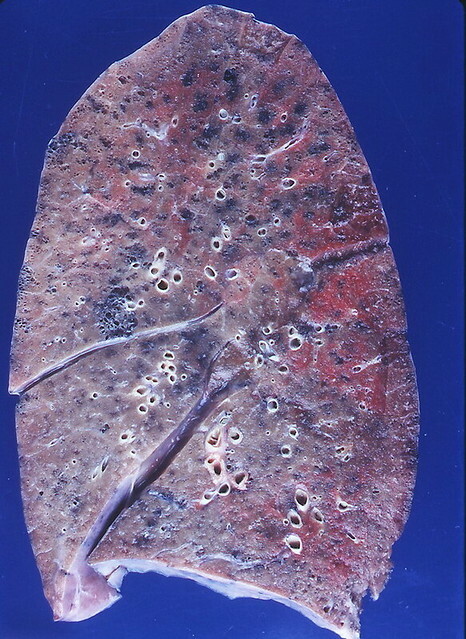 The lesions is localized around a small bronchovascular bundle which is usually located approximately in the center of the secondary lung lobule. The upper portions of both lungs are destroyed by the extensive bullous emphysema. 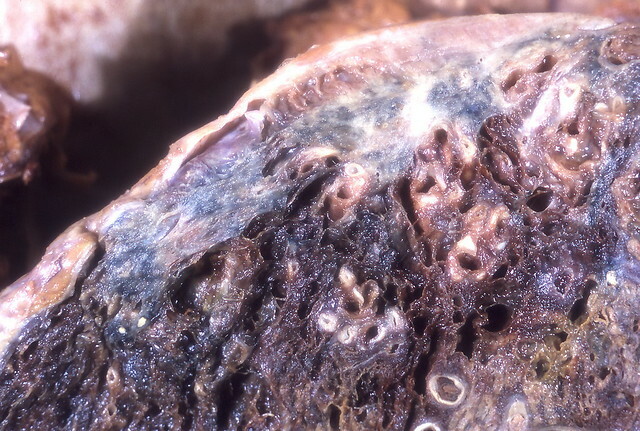 In addition to the extensive honeycombing seen in the lower portion of this lower lobe there is bullous empysema seen at the apex. Honeycombing consists of cystically dilated airways separated by scar tissue resembling the honeycomb of bees. 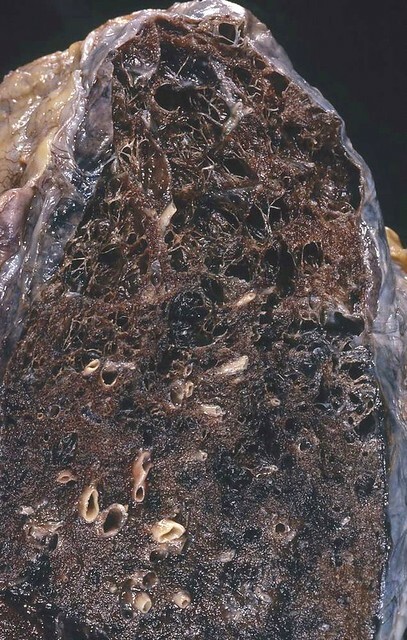 It is a non-specific end stage of many types of interstitial lung disease. 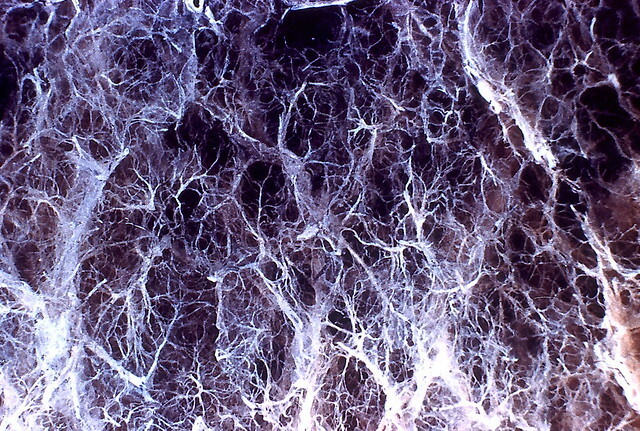 Emphysematous spaces are separated by thin septae and have some resemblance to a spider&apos;s web. 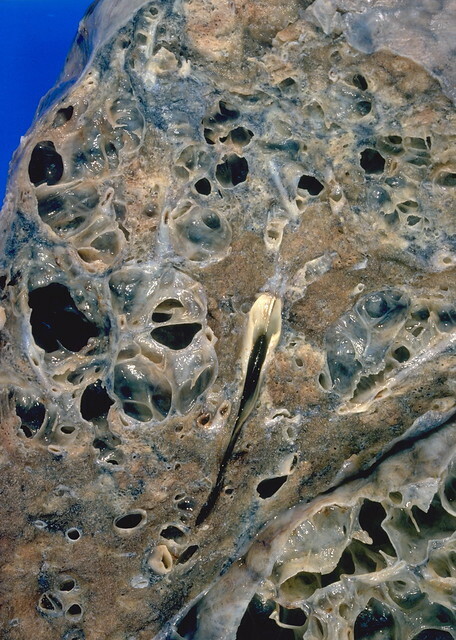 This is an example of pericicitricial emphysema occurring adjacent to an apical scar/apical cap. The overlying pleura is fibrotic and thickened. 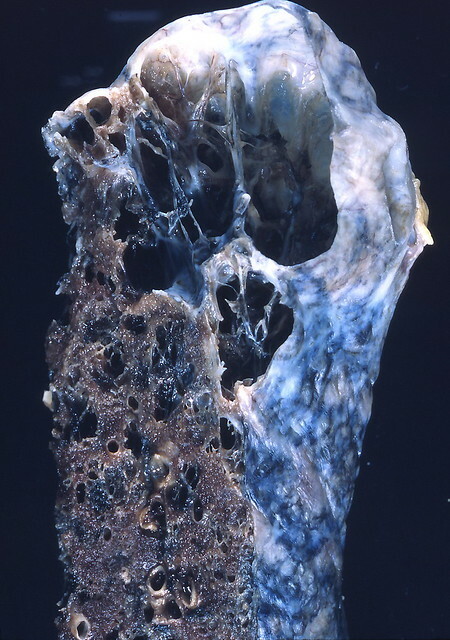 Well-demarcated, pigmented foci of emphysema are present mostly in the upper lobes; the typical location of centrilobular emphysema. 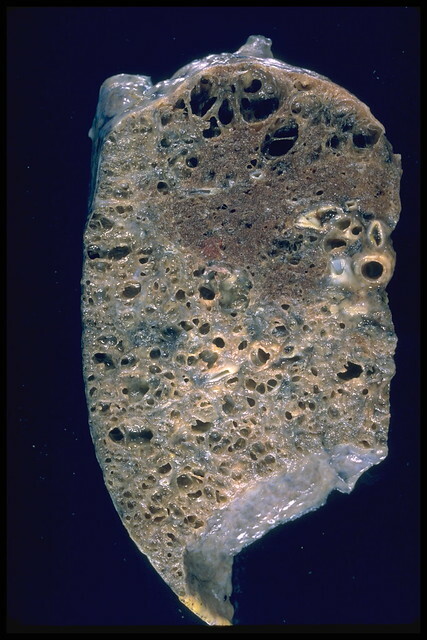 Typical location of centrilobular emphysema is in the upper lobes, especially in the apical region. 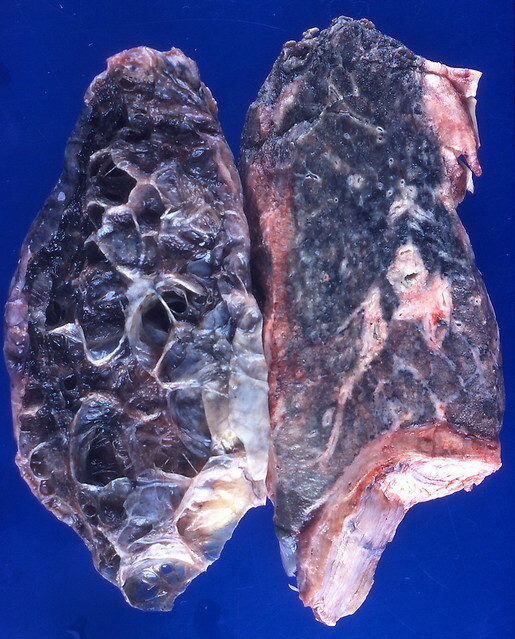 The lung on the left is almost entirely replaced by bullous emphysematous lesions. A bulla is defined as an emphysematous space greater than 1 cm. 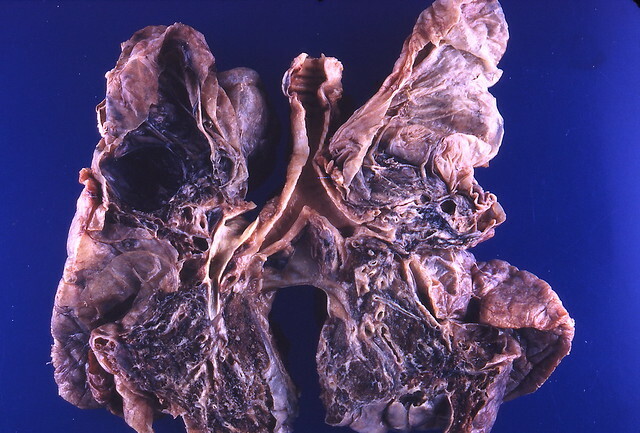 The lung on the right, without emphysematous lesions, is from another case and is included for comparison. 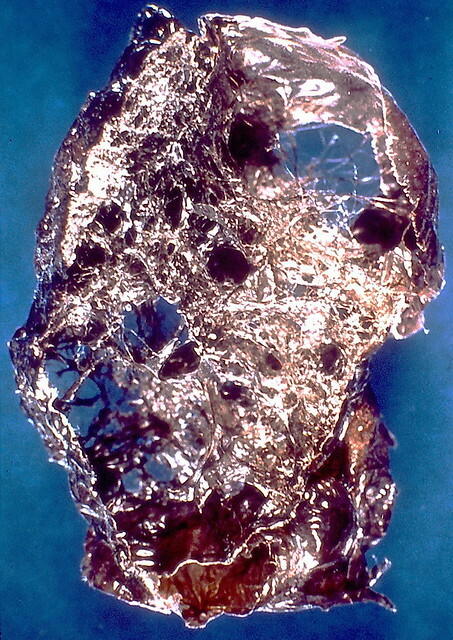 Thin walled emphysematous spaces are present at the left side of this image adjacent to a fibrous septum. 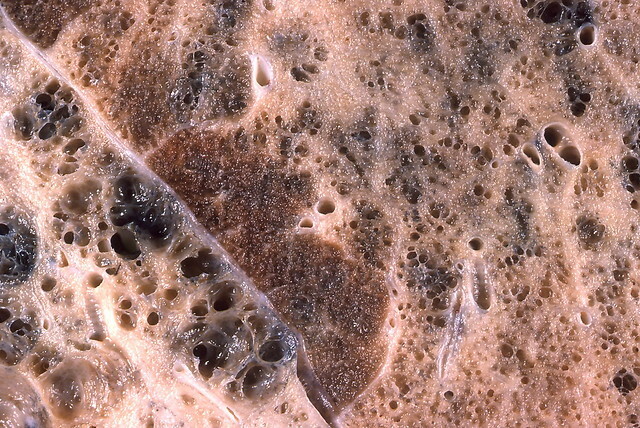 Honeycomb fibrosis, characterized by abnormal spaces separated by broad bands of fibrous tissue is seen on the right side. 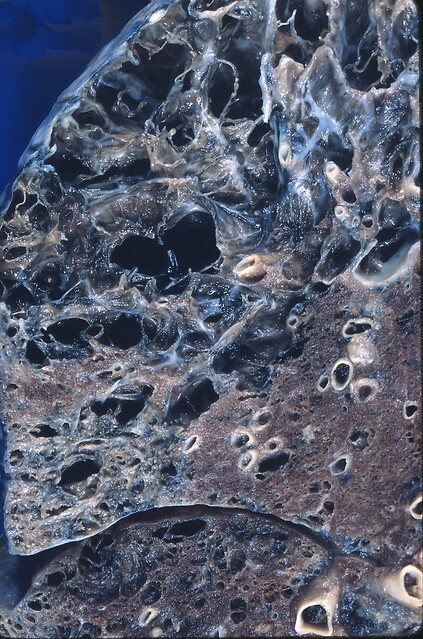 A patch of relatively normal lung tissue is present in the center. Video shows what emphysema means. An abnormal accumulation of air in tissues, most commonly the lungs.. 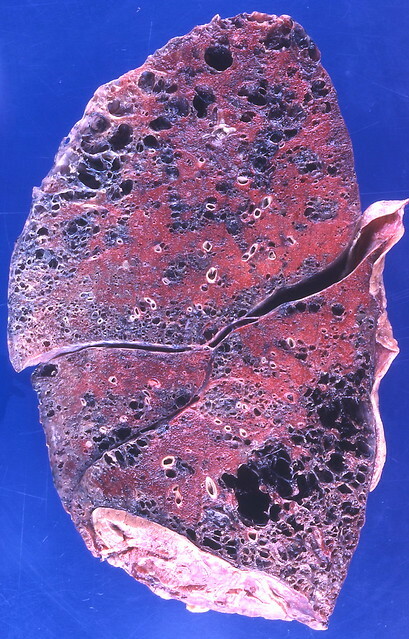 Pulmonary emphysema, a chronic lung disease. See also the pronunciation examples of Emphysema! The value of this 9-letter word is 21 points. It is included in the first and second editions of the Official Scrabble Players Dictionary. Go to the usage examples of Emphysema to see it in context!